区块链日报 - Users’ attention as cryptocurrency: the advertising of the future? Today’s internet economy is mostly built on top of a basic premise: when a service is free to use, it usually means that the revenue is earned by making your personal data a commodity. Advertising is the most common (and easy) way of using your personal data to make money. 2018 was a year filled with online privacy issues. A lot of people found their personal information exposed, and I like to think that many started taking their own privacy and data more seriously. I was one of these people. Currently, users get bombarded with ads as they navigate through websites or use online services. These ads are commissioned by a publisher to an advertiser, who takes care of targeting users to steal their attention. When a user’s attention is caught by an ad, the publisher earns its part of the pie. Often though, a middleman between advertiser and publisher gets a portion of the money exchange through the payment system. Of course, the user never receives any of this money. That’s why I was intrigued when I read about an advertising system based on the user’s intentional attention. How advertising money moves today. Last week I received an email about Coinbase Earn, a site built by Coinbase (the cryptocurrency broker) designed to “earn crypto while learning about crypto”. I learned that way about the Basic Attention Token (BAT) and the web browser Brave, intended to solve the advertising problem described earlier. BAT is a cryptocurrency based on Ethereum, that attempts to quantify the value of users’ attention. The ultimate idea is that when a user decides to watch or read an advertisement, they should be paid for their attention. Similarly, a user may choose to reward their favorite content or service provider by paying them. BAT is attempting to become the currency for these transactions. Now, it would be unfair for BAT-based ads to compete with the regular ads that we all find online, since these are already stealing users’ time and focus. That’s where the web browser Brave comes in. Brave is based on Chromium and comes with a built-in ad blocker and other privacy-focused features. Through this new browser, a user will be able to navigate the web free of distractions; they will also be able to decide at any point to watch a BAT-based ad, getting rewarded in the process. 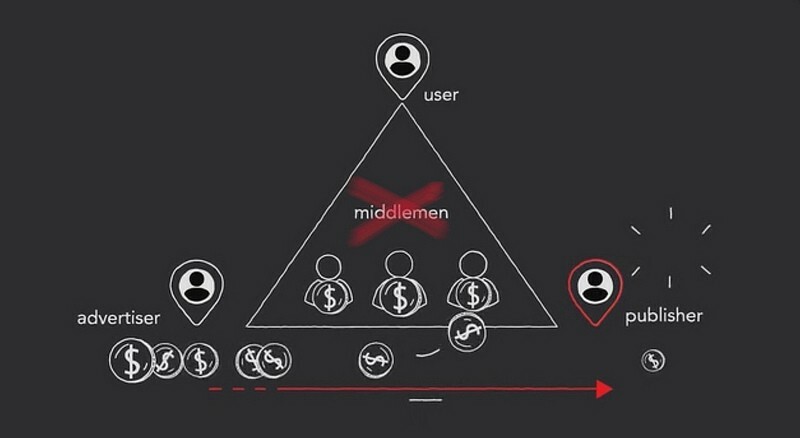 In parallel, a user will be able to pay their favorite content or service providers with their BAT wallet, as long as they are registered to receive tokens. All of these rewards-focused features will be enabled as part of what the Brave team calls “phase 2”. The current “phase 1” is all about socializing the cryptocurrency and the browser, which needs to reach critical mass for the whole project to be successful in the long term. 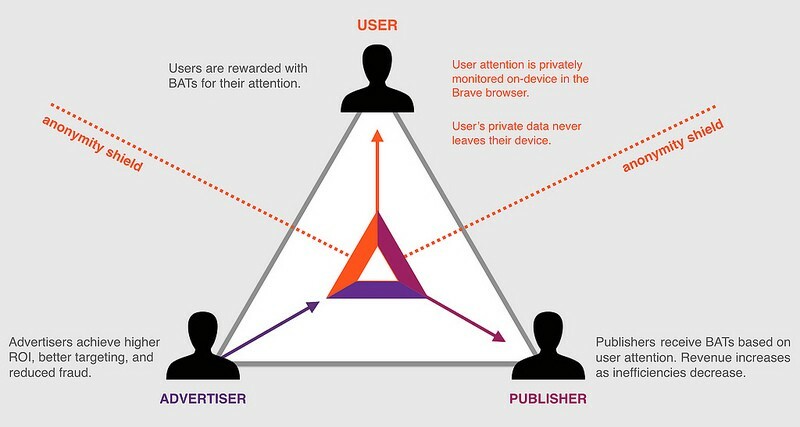 Brave’s ultimate purpose is to be a secure and decentralized BAT exchange platform between advertisers, users and publishers or content providers, eliminating the need for any middleman. How advertising would work under BAT and Brave. Following the true spirit behind BAT, the Coinbase Earn website rewards users with BAT tokens after watching a few educational videos and downloading the Brave browser. At the end of the day, Coinbase Earn is an elaborated ad that tries to promote cryptocurrencies. Nonetheless, is this truly the future of digital advertising? I have to admit that the very first time I read the description of “a cryptocurrency based on the user’s attention”, it immediately reminded me of the dystopian version of the world presented in the Netflix show Maniac. 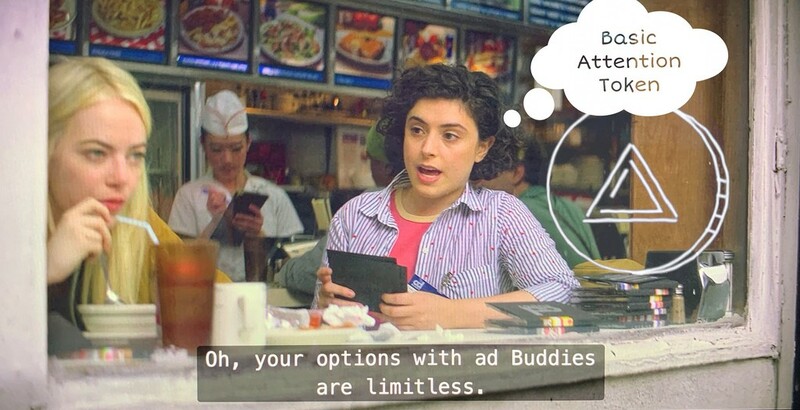 In that show’s universe, people use a service called ‘adBuddy’ that sends them a worker that will read or show them ads in exchange for money, which of course they can use to buy anything. Scene from Netflix’s Maniac, where the protagonist uses an ‘adBuddy’ to pay for her lunch. This part is my biggest concern with the BAT + Brave project’s long-term viability. If the whole world adopted it, we would end up being forced to tediously listen, read or watch advertisements in order to be able to use our beloved online services. If BAT became the fuel for services like email, cloud storage or media streaming, we would need to recharge tokens every now and then in order to be able to use our devices. Privacy activists have been asking big tech companies to provide paid versions of their services as a way of cutting their dependency on users’ personal data, which sustains their business model. Fully switching to paid services, however, could pose a threat to the democratization of technology. Low income families could not afford paying for all the online services they use today; imagine what the internet would become if only the wealthy could access it. Exploiting personal data through ads has prevented this elitist future until now, so maybe we should indeed just focus on fixing the fact that users are not in control of the ads they consume. BAT and Brave are a step in that direction, because it gives users power to decide when to consume ads, effectively translating time into money. Nonetheless, the friction it would cause on our daily lives might be too big to accept. Eventually, many would grow tired of having to make the conscious decision of watching these ads and soon, some company would revert back to a model that offered effortless access to their services, which simply means that ads would get served automatically, mixed with the content. Sounds familiar? Opt-in advertising might not be a solution that can scale for all use cases. We might be inevitably bound to the status quo, destined to admit that our personal data is a more sustainable type of currency for ‘paying’ for our online services. We may never be able to have both a free and a private internet. Originally published at geekonrecord.com on February 11, 2019. Users’ attention as cryptocurrency: the advertising of the future? was originally published in Hacker Noon on Medium, where people are continuing the conversation by highlighting and responding to this story.